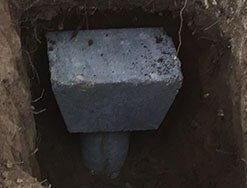 Learn HD Foundations’ Process For Installing Pressed Foundation Pilings. When concrete pier foundation repair is needed, contact HD Foundations. 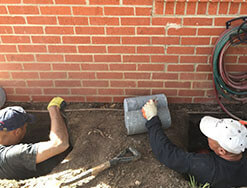 We install foundation piers in the DFW metroplex, including Arlington, Plano, Irving, Fort Worth, and Dallas. Pressed concrete piers are durable foundation piers used for interior and exterior repairs. They work well on pier and beam houses and concrete slab foundations. If you require foundation repair, request a free estimate. These pressed piers are strong. They are highly effective in DFW area clay soils. Pilings of this type are affordable. They’re long lasting and very popular in North Texas. Concrete pilings are capable of supporting the load bearing weight of a typical concrete slab foundation or pier and beam structure. They’re used for commercial or residential applications in Dallas, Fort Worth. We install concrete piers in Arlington, Irving, Plano and the DFW metroplex daily. You may want to study information about steel piers vs. concrete piers: which is better. Holes are excavated in the ground, around the perimeter of your foundation. 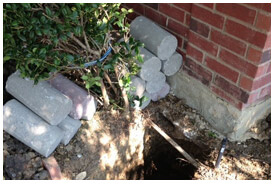 If interior foundation piers are required, we’ll dig holes in the central part of your foundation. When a slab foundation is involved, installing interior piers necessitates cracking the concrete slab. 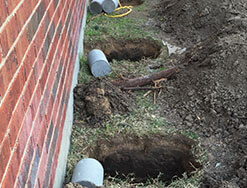 During our 5-steps in the foundation repair process, the concrete piers will be used to stabilize your Dallas, Fort Worth, Arlington or Irving area house. The pressed concrete pilings are forced down into the ground using a hydraulic ram. A concrete cap is placed on top of the piers. A hydraulic bottle jack is positioned on top of the cap and the foundation is lifted. Your foundation is lowered directly on top of the cap and piers. How Long Does It Take To Install Concrete Piers? Homeowners in the Dallas, Fort Worth area can generally have them installed in 1-3 days. For more information, contact HD Foundations. Learn costs for foundation repair using concrete foundation piers in Dallas, Fort Worth, Arlington, Irving, and Plano area. Schedule a concrete pier foundation repair estimate free online today. Or, if you prefer, just call us. We perform thorough foundation evaluations.